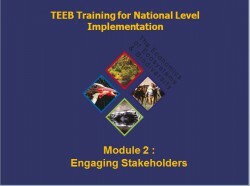 For any feedback or comments on these resource materials, please contact us at teeb@unep.org. Session 1 Stakeholder engagement This session introduces the concepts and key principles behind stakeholder engagement and reasons to engage. It also emphasizes its importance during the implementation of a TEEB study. Session 2 Stakeholder analysis and mapping This session discusses in detail who the potential stakeholder audience might be and what their individual interests are when conducting a TEEB study. The session also suggests ways that stakeholder interests could be prioritized within a TEEB study to encourage fair decision making. Session 3 Mechanisms of engagement and cooperation This session introduces the various mechanisms for engagement and cooperation once the stakeholders have been identified as well as strategies for how to get them, and keep them, on board.